1 Only upon God [waits] my soul [in] silence: From Him is my salvation. 2 Only He is my rock and my salvation, My high tower, I shall not be greatly moved. 3 How long will ye rush upon a man? [How long] will ye all of you break him down, Like a bulging wall, a tottering fence? 4 Only from his elevation do they consult to thrust him down, they delight in lies: Each blesses with his mouth, and in their inner [part] they curse. Selah. 5 Only to God be silent, my soul, For from Him is my expectation. 6 Only He is my rock and my salvation, My high tower; I shall not be moved. 7 On God is my salvation and my glory, The rock of my strength, my refuge, is in God. 8 Trust in him in every time, O people! Pour out before Him your heart, God is a refuge for us. Selah. 9 Only vanity are the sons of the lowly, a lie are the sons of the lofty, In the scales they go up, they are [lighter] than vanity altogether. 10 Trust not in oppressions and in robbery become not vain, When wealth grows, set not your heart thereon. 11 Once has God spoken, twice have I heard this, That strength [belongs] to God. 12 And to Thee, O God, [belongs] loving-kindness, For Thou, Thou renderest to a man according to his work. There are several points of affinity between this psalm and the thirty-ninth,--such as the frequent use of the particle of asseveration or restriction ("surely" or "only"); the rare and beautiful word for "silence," as expressing restful, still resignation; and the characterisation of men as "vanity." These resemblances are not proofs of identity of authorship, though establishing a presumption in its favour. Delitzsch accepts the psalm as Davidic, and refers it to the time of Absalom's revolt. The singer is evidently in a position of dignity ("elevation," ver. 4), and one whose exhortations come with force to the "people" (ver. 8), whether that word is understood as designating the nation or his immediate followers. Cheyne, who relegates the psalm to the Persian period, feels that the recognition of the singer as "a personage who is the Church's bulwark" is the natural impression on reading the psalm ("Orig. of Psalt.," 227, and 242, n.). If so, David's position is precisely that which is required. Whoever sang this immortal psalm, rose to the heights of conquering faith, and gave voice to the deepest and most permanent emotions of devout souls. The psalm is in three strophes of four verses each, the divisions being marked by Selah. The two former have a long refrain at the beginning, instead of, as usually, at the end. In the first the psalmist sets his quiet trust in contrast with the furious assaults of his foes; while, in the second, he stirs himself to renewed exercise of it, and exhorts others to share with him in the security of God as a place of refuge. In the third strophe the nothingness of man is set in strong contrast to the power and loving-kindness of God, and the dehortation from trust in material wealth urged as the negative side of the previous exhortation to trust in God. The noble saying of ver. 1 a is hard to translate without weakening. The initial word may have the meanings of "Only" or "Surely." The former seems more appropriate in this psalm, where it occurs six times, in one only of which (ver. 4) does the latter seem the more natural rendering, though even there the other is possible. It is, however, to be noticed that its restrictive power is not always directed to the adjacent word; and here it may either present God as the exclusive object of the psalmist's waiting trust, or his whole soul as being nothing else but silent resignation. The reference to God is favoured by ver. 2, but the other is possible. The psalmist's whole being is, as it were, but one stillness of submission. The noises of contending desires, the whispers of earthly hopes, the mutterings of short-sighted fears, the self-asserting accents of an insisting will, are hushed, and all his nature waits mutely for God's voice. No wonder that a psalm which begins thus should end with "God hath spoken once, twice have I heard this"; for such waiting is never in vain. The soul that cleaves to God is still; and, being still, is capable of hearing the Divine whispers which deepen the silence which they bless. "There is no joy but calm"; and the secret of calm is to turn the current of the being to God. Then it is like a sea at rest. The psalmist's silence finds voice, which does not break it, in saying over to himself what God is to him. His accumulation of epithets reminds us of Psalm xviii. 1, 2. Not only does his salvation come from God, but God Himself is the salvation which He sends forth like an angel. The recognition of God as his defence is the ground of "silence"; for if He is "my rock and my salvation," what can be wiser than to keep close to Him, and let Him do as He will? The assurance of personal safety is inseparable from such a thought of God. Nothing which does not shake the rock can shake the frail tent pitched on it. As long as the tower stands, its inhabitant can look down from his inaccessible fastness with equanimity, though assailed by crowds. Thus the psalmist turns swiftly, in the latter pair of verses making up the first strophe, to address remonstrances to his enemies, as engaged in a useless effort, and then drops direct address and speaks of their hostility and treachery. The precise meaning of parts of ver. 3 has been misapprehended, by reason of the peculiarities of some of the words and the condensed character of the imagery in b, c. The rendering above is substantially that generally accepted now. It sets in striking contrast the single figure of the psalmist and the multitude of his assailants. "All of you" rush upon a man like a pack of hounds on one defenceless creature, and try to break him down, as men put their shoulders to a wall in order to overthrow it. The partial success of the assault is hinted in the epithets applied to wall and fence, which are painted as beginning to give under pressure. Language of confidence sounds strangely in such circumstances. But the toppling wall, with all these strong men pushing at it, will "not be greatly moved." The assailants might answer the psalmist's "How long?" with defiant confidence that a short time only was needed to complete the begun ruin; but he, firm in his faith, though tottering in his fortunes, knows better, and, in effect, tells them by his question that, however long they may press against his feebleness, they will never overthrow him. The bulging wall outlasts its would-be destroyers. But appeal to them is vain; for they have one settled purpose absorbing them--namely, to cast him down from his height. He is, then, probably in some position of distinction, threatened by false friends, who are plotting his deposition, while their words are fair. All these circumstances agree well with the Davidic authorship. The second strophe reiterates the refrain, with slight but significant variations, and substitutes for the address to and contemplation of the plotters a meditation on the psalmist's own security, and an invitation to others to share it. In ver. 5 the refrain is changed from a declaration of the psalmist's silent waiting to self-exhortation thereto. Cheyne would assimilate the two verses by making both verbs imperatives; but that change destroys the beautiful play of feeling, so true to experience, which passes from consciousness of one's attitude towards God to effort at preserving it. No emotions, however blessed, deep, and real, will last, unless perpetually renewed. Like carbon points in electric lights, they burn away as they burn, and the light dies, unless there is some impulse which presses a fresh surface forward to receive the fiery kiss that changes its blackness into radiance. The "expectation" in ver. 5 b is substantially equivalent to the "salvation" in ver. 1 b. It means not the emotion (which could not be said to be "from Him"), but the thing expected, just as "hope" is used for the res sperata. The change in expression from "salvation" to "expectation" makes prominent the psalmist's attitude. In his silence his wistful eyes look up, watching for the first far-off brightening which tells him that help is on its road from the throne. Salvation will not come unexpected, and expectation will not look for succours in vain. There may be deep meaning in the slight omission of "greatly" in the second refrain. Confidence has grown. The first hope was that the waiting heart should not be much shaken, that the tottering fence should not be quite thrown down; the second is that it shall not be shaken at all. An access of faith has poured into the singer's soul with his song; and now he has no thought of the crowd of assailants, who have faded from his sight because he is gazing on God. Hence the second pair of verses in this strophe (vv. 7, 8) substitutes for the description of their fierce rush the triumphant reiteration of what God is to the psalmist, and an invitation to others to come with him into that strong refuge. The transition to addressing the "people" is natural, if the psalm is David's. The phrase would then apply to his immediate followers, who were one with him in peril, and whom he would fain have one with him in trust. But the LXX. has another reading, which involves only the insertion of a letter, that may easily have dropped out, in the word rendered "time," and which makes the verse run more smoothly. It reads "all the congregation of the people," in which it is followed by Baethgen, Cheyne, and others. Whoever the psalmist was, he felt the impulse which follows all deep experience of the security that comes from hiding in God--namely, the longing to beckon in others out of the storm into peace. Every man who has learned that God is a refuge for him is thereby assured that He is the same for all men, and thereby moved to beseech them to make the like blessed discovery. The way into that hiding-place is trust. "Pour out before Him your heart," says the psalmist. "In everything by prayer and supplication with thanksgiving let your requests be made known unto God," says Paul. They both mean the same thing. We take refuge in our refuge when we set our faith on God, and tell Him all that threatens or troubles us. When we do, we are no longer in the open, defenceless before the rush of enemies, but housed in God, or, as Paul puts it, guarded in Christ Jesus, as in a fortress. No wonder that the psalm pauses for a moment on that thought, and lets the notes of harp and horn impress it on the listeners! The third strophe sets the emptiness of men in strong contrast to the sufficiency of God. "Vanity" is literally "a breath," and would better be so rendered in ver. 9, but for the recurrence of the verb from the same root in ver. 10, which requires the rendering "be not vain." It is desirable to preserve identity of translation, so as to retain the play of words. But by doing so ver. 9 is somewhat weakened. The eyes that have been looking on God are cleared to see the shadowy nothingness of men of all degrees. The differences of high and low dwindle when seen from that "high tower," as lower lands appear flat when viewed from a mountain top. They are but "breath," so fleeting, unsubstantial are they. They are a "lie," in so far as hopes directed to them are deceived and trust misplaced. The singer is not cynically proclaiming man's worthlessness, but asserting his insufficiency as the object of man's trust. 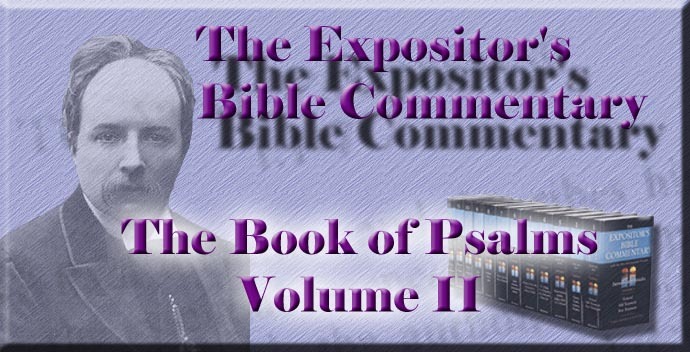 His point of view is different from that of Psalm xxxix., though his words are the same. The "Only" which begins ver. 9 carries us back to the similar beginning of the preceding strophes, and brings out the true force of the following words, by suggesting the contrast between men and the God on whom the psalmist's soul waits in silence. That contrast may be further continued in ver. 9 b. The lowly and the lofty are in one scale. What is in the other, the solid weight of which sends them aloft as lighter? Is it pressing the metaphor too far to suppose that the psalmist is weighing the whole mass of men against God only? Heap them altogether and balance them against Him, and the gathered mass does not weigh as much as an imponderable breath. Who could trust in that emptiness when he has God to trust in? Who would grasp shadows when he may cling to that eternal Substance? The natural conclusion from ver. 9 follows in the exhortation of ver. 10, which completes the positive presentation of the true object of trust (ver. 8) by the warning against false refuges. The introduction of "oppression" and "robbery" is singular, for it can scarcely be supposed that the assailants of the psalmist are here addressed, and still less that his followers needed to be warned against these crimes. Cheyne, therefore, follows Graetz and others in reading "perverseness" for "oppression," and "crookedness" for "robbery"; but the alteration throws the clause out of harmony with the next clause. It may be that in ver. 10 a the psalmist has in view unjust gain and in b justly acquired wealth, and that thus his two dehortations cover the whole ground of material riches, as if he had said, "Whether rightly or wrongly won, they are wrongly used if they are trusted in." The folly and misery of such trust are vigorously set forth by that word "become vain." The curse of misplaced confidence is that it brings down a man to the level of what he trusts in, as the blessing of wisely placed trust is that it lifts him to that level. Trust in vanity is vain, and makes the truster "vanity." Wind is not a nourishing diet. It may inflate, or, as Paul says about knowledge, may "puff up," but not "build up." Men are assimilated to the objects of their trust; and if these are empty, "so is every one that trusteth in them." So far the psalmist has spoken. But his silent waiting has been rewarded with a clear voice from heaven, confirming that of his faith. It is most natural to regard the double revelation received by the psalmist as repeated in the following proclamation of the two great aspects of the Divine nature--Power and Loving-kindness. The psalmist has learned that these two are not opposed nor separate, but blend harmoniously in God's nature, and are confluent in all His works. Power is softened and directed by Loving-kindness. Loving-kindness has as its instrument Omnipotence. The synthesis of these two is in the God whom men are invited to trust; and such trust can never be disappointed; for His Power and His Loving-kindness will co-operate to "render to a man according to his work." The last word of the psalm adds the conception of Righteousness to those of Power and Loving-kindness. But the psalmist seems to have in view mainly one direction in which that rendering "to a man according to his work" is active--namely, in answering the trust which turns away from human power which is weakness, and from human love which may change and must die, to anchor itself on the might and tenderness of God. Such "work of faith" will not be in vain; for these twin attributes of Power and Love are pledged to requite it with security and peace.